​The ancestors of mankind have recorded their thoughts and ideas with language and words and built “Babel Towers” that shaped our spiritual core and were condensed into the cultural ties of each nation. However, three out of the four ancient civilizations have been buried in the dust of years. As a social life body, Chinese characters have never been interrupted throughout its thousands of years with its resilient vitality and stability. From the oracle bones that communicated with God, to the small seal script (Xiao Zhuan) used by ancient emperors, to clerical script (Li Shu) needed by political rule in ancient China, all to show the profoundness of Chinese characters and calligraphy. How to write beautiful characters had long become an independent category of art in China. From the Han Dynasty wooden slips unearthed in Dunhuang, it can be found that Chinese civil servants have begun to practice Chinese writing skills more than 2,000 years ago. In the traditional society of China, the quality of writing not only has an impact on the achievements of imperial examinations, but also is an important way for Chinese scholars to improve their personal accomplishment. Calligraphy taste represents a person’s character. The perfect combination of poetry, calligraphy, painting and seal is a symbol of the maturity of Chinese literati’s paintings and the highest realm of Chinese art. 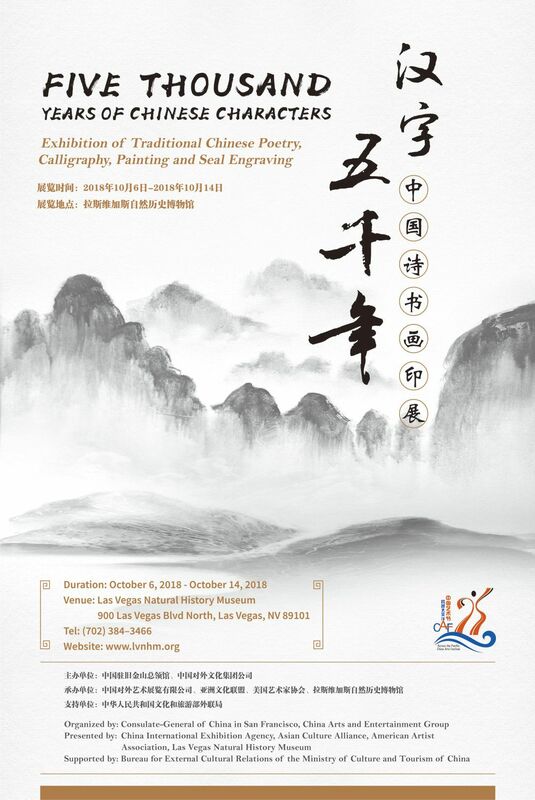 The "Five Thousand Years of Chinese Characters - Exhibition of Traditional Chinese Poetry, Calligraphy, Painting and Seal Engraving" is organized by Consulate-General of China in San Francisco and China Arts and Entertainment Group, presented by China International Exhibition Agency, Asian Culture Alliance, American Artists Association and Las Vegas Natural History Museum, and supported by the Bureau for External Cultural Relations of the Ministry of Culture and Tourism of China. The exhibition was highly valued by the Chinese Consulate-General in San Francisco, and was included in the “5th Across the Pacific - China Arts Festival”. This will be an important dimension in understanding the development of Chinese art, also an important perspective of learning about China's social development. This exhibition attracted works of artists from well-known universities, museums and art associations, such as Tsinghua University, China Academy of Fine Arts, Lanting Calligraphy Museum, Chinese Calligraphers Association, including calligraphy, painting, seal engraving, ceramic handicraft and other art forms. The exhibition outlines the 5,000-year history of Chinese calligraphy through the pieces of work, supplemented by paintings of flowers and birds, figures and landscape. The chirography covers oracle bone script, bronze inscription, seal script, clerical script, regular script, semi-cursive script and cursive script. 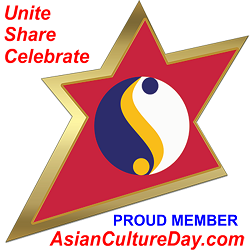 Ten artists, including Ni Wendong, Mei Mosheng, Mao Feng, Luo Sangui, Yu Geliang, Deng Baojian, Nie Hui, Xie Feidong, Yu Bo and Wang Yazhou, are all unique creators with rich artistic language and perceptual artistic intuition. They pay close attention to the spiritual potential of themselves, and seek for the essence of life. Through the interesting calligraphy and painting works of the artists, we can meditate the inheritance and innovation of contemporary Chinese calligraphy and painting, understand Chinese calligraphy and painting from a close and multi-perspective, build a bridge of cultural communication with calligraphy and Chinese painting and share this cultural treasure with the American audience. Characters are the carrier of culture. Chinese characters contain the Oriental way of thinking. Concretization, metaphor and knowing are the cores of Chinese culture, such thinking form is melted into Chinese characters, making it the carrier of the soul and the most important national spiritual resource. Over the long historical years, although the shapes of Chinese characters have changed from time to time, they have come down in one continuous line. They faithfully recorded the glorious course of the 5,000-year Chinese civilization, clearly illuminating the long road ahead of the Chinese nation.